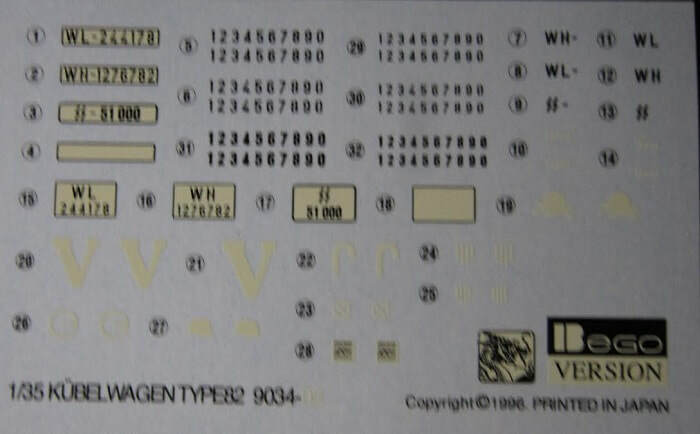 I paid $23.98 for my kit back in the late 90's at my local hobby shop. Kit has a copyright date of 1998. The Volkswagen Kübelwagen (literally, "Tub" car, previously mostly used for rail, industrial or agricultural hopper cars) was a light military vehicle designed by Ferdinand Porsche and built by Volkswagen during World War II for use by the German military (both Wehrmacht and Waffen-SS). Based heavily on the Volkswagen Beetle, it was prototyped as the Type 62, but eventually became known internally as the Type 82. 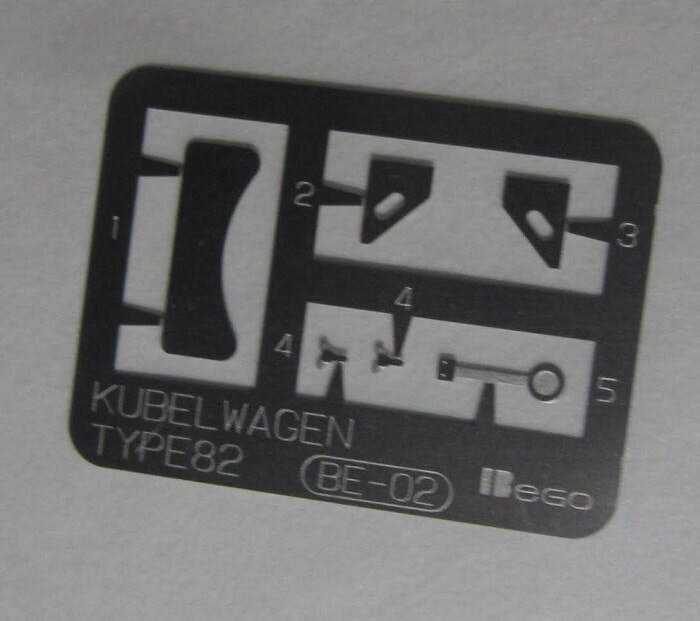 Kübelwagen is an abbreviation of Kübelsitzwagen, meaning "bucket-seat car" because all German light military vehicles that had no doors were fitted with bucket seats to prevent passengers from falling out[dubious – discuss]. The first VW test vehicles had no doors and were therefore fitted with bucket seats, so acquiring the name VW Kübelsitzwagen that was later shortened to Kübelwagen. 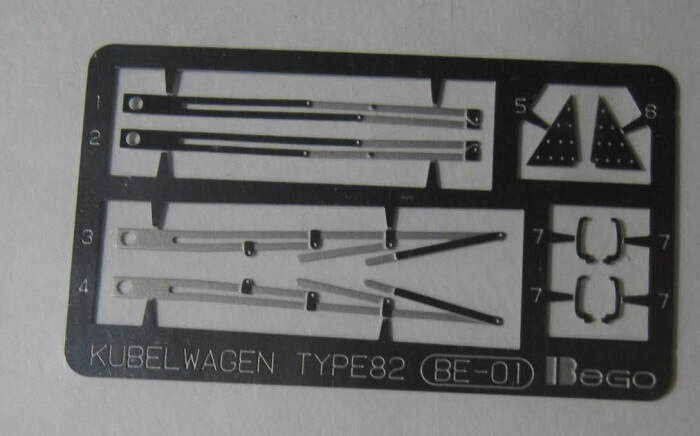 Mercedes, Opel and Tatra also built Kübel(sitz)wagens. With its rolling chassis and mechanics built at Stadt des KdF-Wagens (renamed Wolfsburg after 1945), and its body built by US-owned firm Ambi Budd Presswerke in Berlin, the Kübelwagen was for the Germans what the Jeep and GAZ-67 were for the Allies. 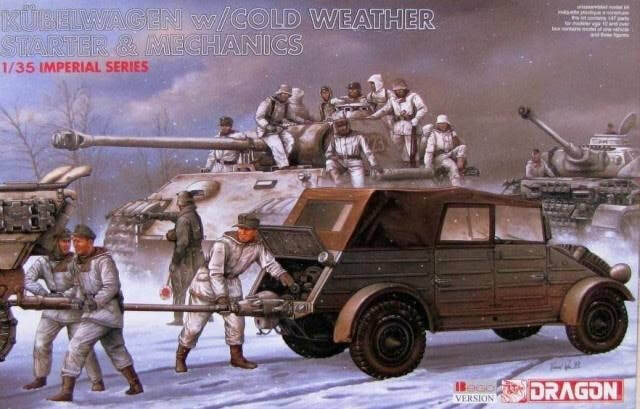 The box art shows 3 German mechanics hooking-up a starter pole from the engine compartment of a Kubelwagen to the back of a Tiger tank to give it a jump-start. It is a winter scene with snow on the ground. A couple of Panther tanks are passing by. The lead one of those has 9 infantryment riding on top of it. All are in winter uniforms and the Panther's are coated with winter white-wash. The three mechanics are also in white uniforms with their pants bloused into black jack boots. They all wear field-grey cloth caps. There is a field policeman directing the Panthers with his traffic baton. He wears a field-grey uniform and a steel helmet. One side panel of the box has the color box art of another figure kit that DML manufactures: kit no. 6089, German Nachtjager Troops (Berlin 1945). This is followed by a CAUTION to be in a well-ventilated room when using cement or paint, in 6 languages including English. ​Kit is not suitable for children under 3 due to small, sharp parts. 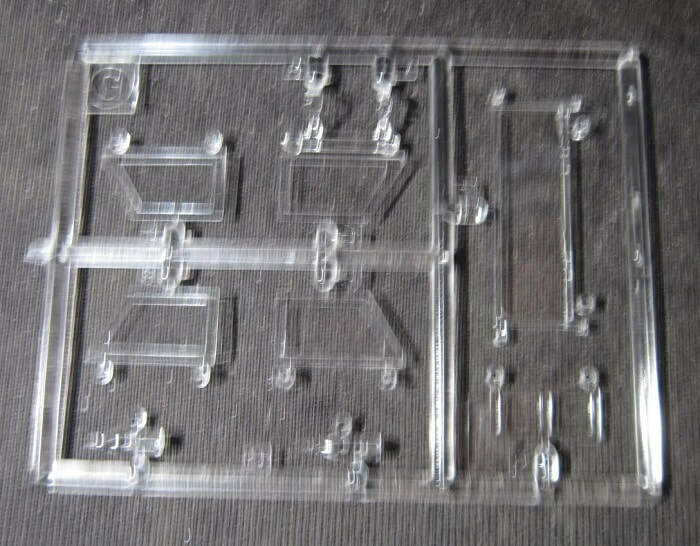 It is designed for modelers age 10 to adult. The copyright date for the kit is 1998 and DML's address in Hong Kong, China is provided and the kit was made there. The other side panel has 4 color walk-around type photos of the model made up. However, the mechanics have been painted with camouflaged uniforms. Paint and cement are said to be not included. 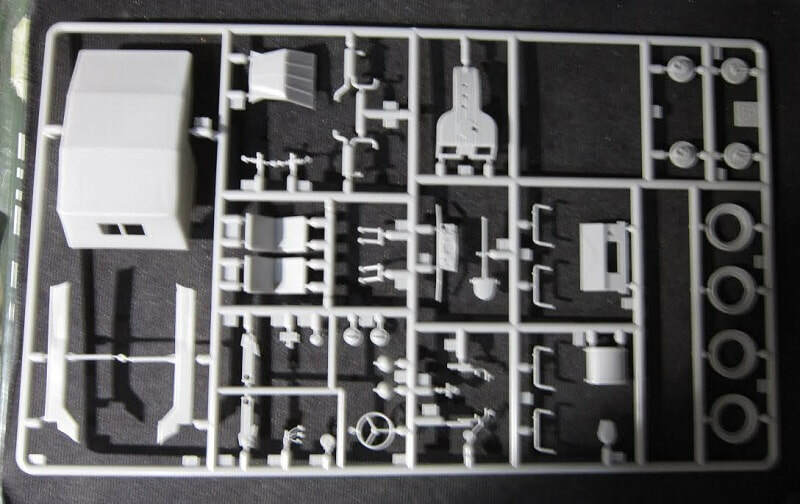 This kit contains 7 light-grey trees, a clear tree, 2 steel PE frets and the decal sheet. The steel frets and the decal sheet are in a sealed cello and the clear tree is also in its own cello. All the parts are inside a large cello bag. The instructions complete the kits contents. It consists of a single sheet that accordion-folds out into 10 pages in 5 1/2" x 7 1/4" page format. 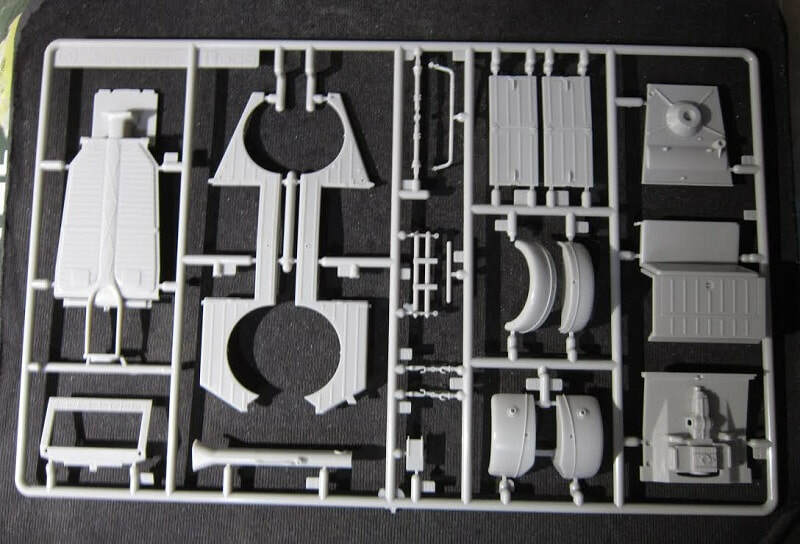 Page 1 begins with a black and white repeat of the box art, over assembly instructions for the 3 figures each shown as a 2-view. Pages 2 through 7 give a grand total of 17 assembly steps. Page 8 has two 4-views for marking and painting. A Kubelwagen with the German Luftwaffe. It is overll panzer-grey with a khaki canvas roof. It has a white letter "V" on the sides of the front doors and on the center of the rear. Its license plate number is WL-244178. There is a white upside-down letter "J" on the front of the right front fender and again to the left of the "V" on the rear. No unit is given for this vehicle. The second Kubelwage says it is with German Heeres. It is panzer-grey overall too with a khaki canvas roof. It has a black tactical marking of 3 vertical bars over a wagon wheel on the front of the right front fender and the left of the rear. Its license plate number is WH-1276782. No unit is given for this vehicle either. Page 9 has another 4-view at the top of it. 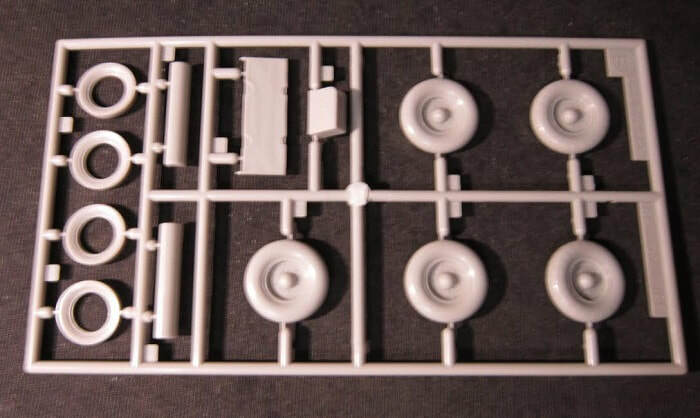 It says it is a Kubelwagen with German Armed Forces only. It is overall panzer-grey with the khaki canvas roof again. It has the license number SS-51000 and a white skull and crossbones illustration on the front of the left front fender and the left side of the rear. Below this 4-view is illustrations of the 3 mechanics with color instructions for them and a patch of camouflage. Page 10 has the parts trees illustrations. 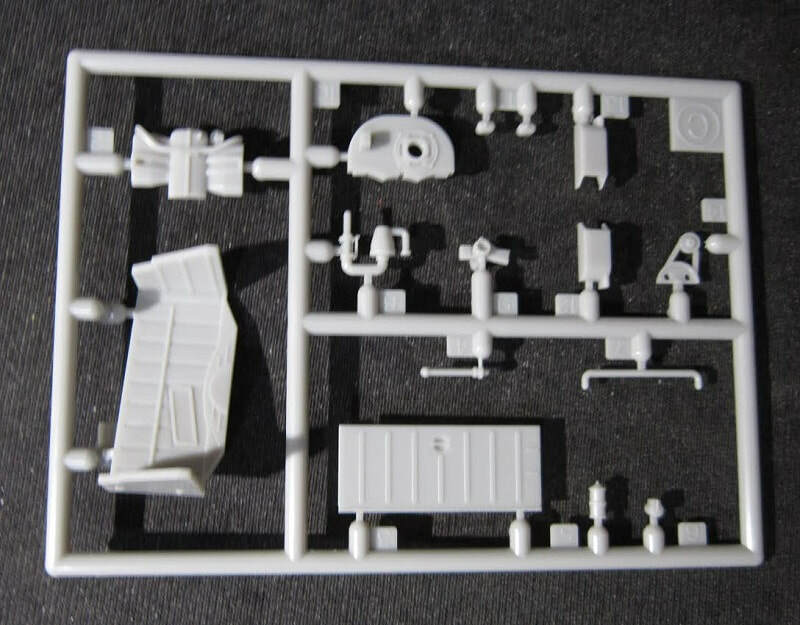 Some parts are blued out here, indicating that they are excess and not needed to complete the kit. Below them is the copyright repeated of 1998 for this kit and PRINTED IN HONG KONG. The bottom of the page has the decal application instructions. This tree is co-joined to a tree that is not alphabetized. ​Letter G tree is the clear window parts. 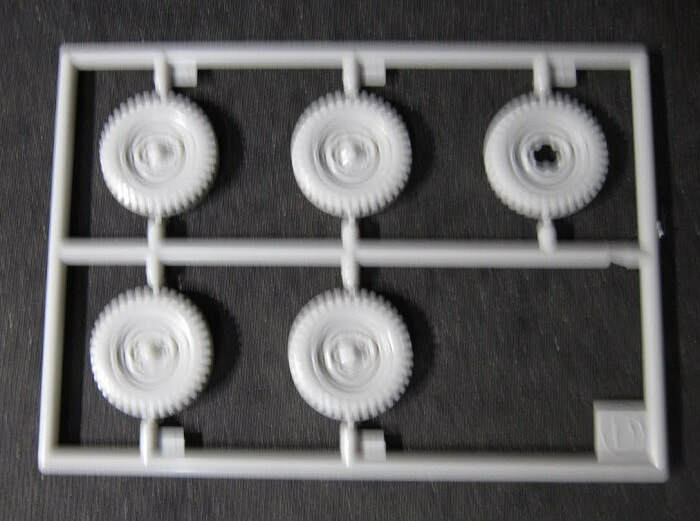 (8 parts) 6 of these parts are excess and not needed. Nice to get something extra once in a while. ​This is a neat diorama idea once you add a Tiger tank to the scene.